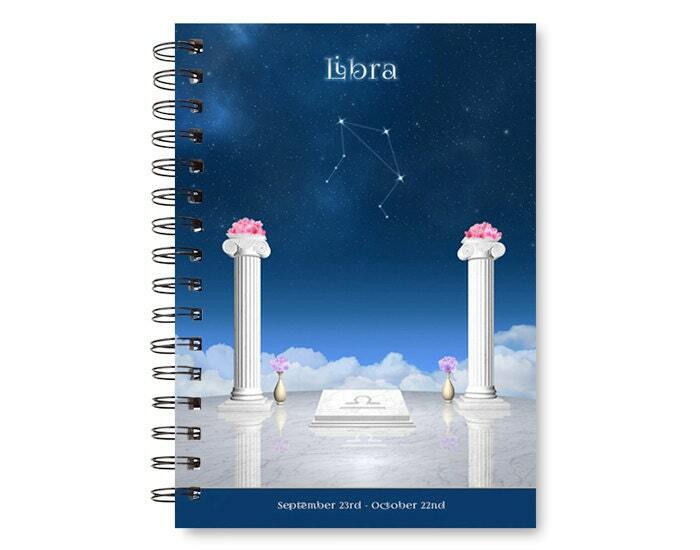 Beautiful spiral notebook for Libra! Shows a mystical scene of 2 columns with flowers under a starry sky, with the Libra constellation prominent; sun sign dates are at the bottom. - along with Libra's element (air) and ruler (Venus). Covers are glossy; inside pages are lined. Makes a great gift for the astrology lover! Are you a Libra but prefer a different design from the notebooks menu? - or do you like the Libra design but you're not a Libra? Choose Custom from the Notebooks page (or copy this url in your browser: http://tinyurl.com/pj7pyum); select your sign and preferred design, and I will customize your notebook!